Your sign system should be a function of your setting, both physically and aesthetically. For instance, will you be installing it inside, or outside in bright sunshine? Will you display it under standard conditions or in a high-temperature factory environment? Finally, does it call for fashionable, contemporary colors or more muted industrial hues? The sizes and shapes of the signs are important, too. That might mean deciding between a full and half sheet that you can cut with our efficient collateral machines. Or you might prefer our precision pre-cut sign blanks with beveled edges, and perhaps adhesive backing for tool-free installation. Whatever you choose, Scott Machine can give you exactly what you need, even down to rounding the corners or drilling the holes. We have a plastic for every environment, and a size for every situation. And we manufacture most of the materials shown, right here in our upstate New York facility. So we can quote refreshingly economical prices that are factory-direct, whether for a couple dozen blank name tags, hundreds of sign blanks or one of our quiet benchtop machines that does the job in minutes. 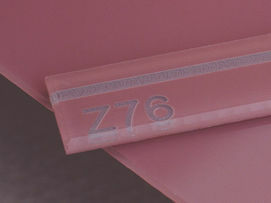 Engraving plastic begins with a solid color – this is the color of the lettering, shown here as black. 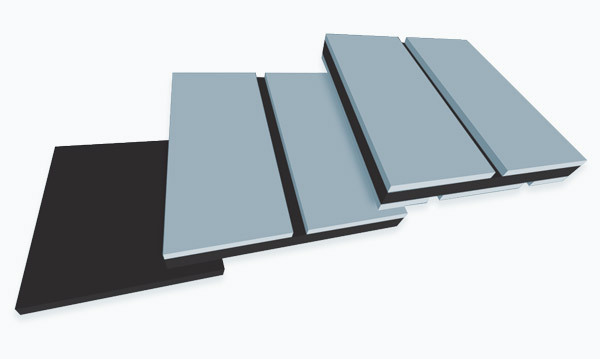 We add a top layer – known as a “ply” – of a different color, shown here as gray. This creates 2-ply engraving material. If a sign has information on both sides, like a tent sign or a ceiling hanger, then we add a colored layer on both sides, leading to the gray-black-gray "3-ply" material shown on the far right. Click any image for a close-up view. Where detail is essential, this rotary engraving plastic ensures bright white or rich black letters with crisp edges. Select from a wide array of matte colors for this plastic, which achieves excellent results with beveling, shearing, punching and corner-rounding. It can provide years of outdoor use, thanks to its fade-resistant top colors over a substrate that does not crack or chalk. Why not polish your message with our brushed metal engraving plastic, which offers a sleek, contemporary look. Metallics are unsuitable for outdoor use. Here’s a brushed satin material that’s as sturdy as it is stylish. The colored layer is 0.010" thick, making this a wise choice for key fobs, luggage tags and other applications where constant scuffing is a problem. In industry, choose this engraving material for warehouse signs, instruction panels on fork lifts, signs near loading docks -- wherever bumps, bruises and scrapes are common. Have a hot application? 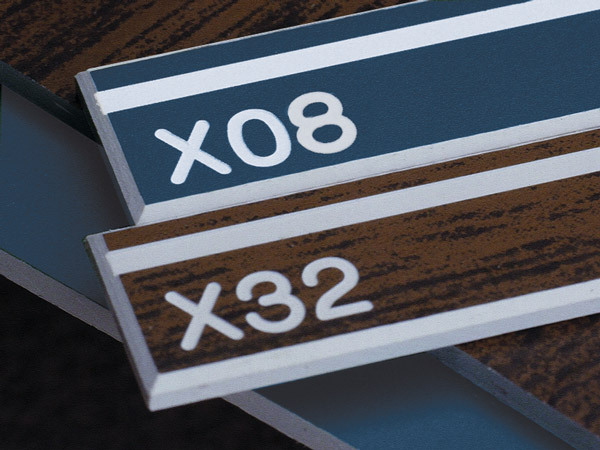 This rigid phenolic engraving material is right at home for pipe markers, valve tags, instrument panels in boiler rooms, engine rooms and similar circumstances. 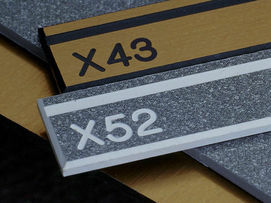 Because the material is rigid, it must be cut with a rotary saw and engraved slowly. 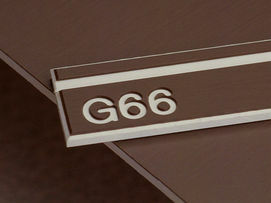 Let us prepare your sign blanks and valve tags, then you can do the engraving. Now that’s teamwork! Here's a non-glare, textured surface that minimizes fingerprints, making it ideal for general office signs and desk name plates. The micro-thin surface is suitable for rotary engraving small letters and fine lines. It's flexible – and suitable for use indoors and out. The colors and textured surface displayed here are coordinated with our SignMate sign holders for a distinctive, professional look. 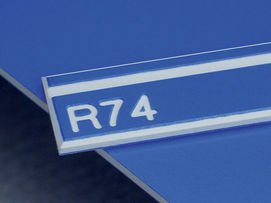 When you engrave the back surface of this “reverse engraving” material, the letters appear frosted. The lettering is then made highly legible by spray painting, which creates the illusion that the words are “floating” in the sign. You can find innumerable colors of spray paints intended for use on plastics at any hobby shop, building supply or art supply store. So be creative with messaging that really stands out! 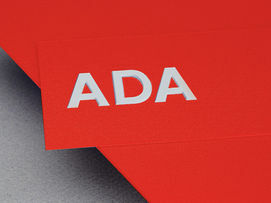 This 1-ply, solid color material is widely used for ADA signs, where a non-glare surface is mandatory. 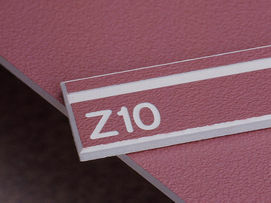 The 1/16" thick material is used for the base layer for tactile signs. Apply 1/32" thick, adhesive-backed material to the base layer, then profile cut the tactile lettering for a sign that makes its own unique statement. Still have questions? Let’s talk, and let’s send you some helpful samples too. In the meantime, you can download a color chart with prices right now from our Prices & Catalogs page. Our goal is to get you “signed up” at your earliest convenience.